L&T Construction - Power Transmission & Distribution - is part of the USD 11.7 billion Larsen and Toubro conglomerate. It offers design and construction services for industrial and project electrification, power transmission and distribution projects, railway construction and solar power plants. 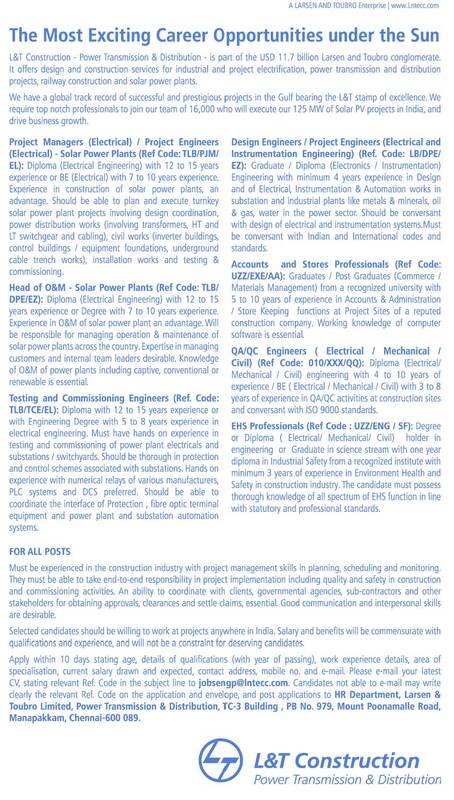 Project Managers (Electrical)/ Project Engineers (Electrical) - Solar Power Plants (Ref Code:TLB/PJM/ EL): Diploma (Electrical Engineering) with 12 to 15 years’ experience or BE (Electrical) with 7 to 10 years’ experience. 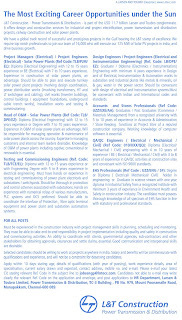 Diploma (Electrical Engineering) with 12 to 15 years’ experience or Degree with 7 to 10 years’ experience. Graduate / Diploma (Electronics / Instrumentation) Engineering with minimum 4 years experience in Design and of Electrical, Instrumentation & Automation works in substation and industrial plants like metals & minerals, oil & gas, water in the power sector. 5 to 10 years of experience in Accounts & Administration / Store Keeping functions at Project Sites of a reputed construction company. Working knowledge of computer software is essential. Diploma (Electrical/ Mechanical / Civil) engineering with 4 to 10 years of experience / BE ( Electrical / Mechanical / Civil) with 3 to 8 years of experience in QA/QC activities at construction sites and conversant with ISO 9000 standards. Degree or Diploma ( Electrical/ Mechanical/ Civil) holder in engineering or Graduate in science stream with one year diploma in Industrial Safety from a recognized institute with minimum 3 years of experience in Environment Health and Safety in construction industry.